Statistics often can create a great deal of confusion and anxiety � triggering unfounded alarm. There are many risk factors for breast cancer, and having a history of breast cancer in the family is only one of the risk factors. Having a first-degree relative (e.g., mother, father sister, daughter) with breast cancer can double a woman�s risk of developing breast cancer. However, whether or not a woman with a family history of breast cancer will ever develop breast cancer depends upon many risk factors. Research has discovered some abnormalities (mutations) in genes called BRCA1 and BRCA2 that are associated with an increased risk of breast cancer and ovarian cancer. Of breast cancer occurring in women with strong family histories of the illness, approximately 80% of the cases are due to the presence of mutations in BRCA1 or BRCA2 genes. Breast cancer due to an inherited mutation in the BRCA1 or BRCA2 gene tends to happen at an early age (prior to menopause, including before the woman is 40 or 50 years of age), in multiple relatives, and in one or both breasts (but usually not at the same time). Mutatations in BRCA1 and BRCA2 genes also are associated with an increased risk of ovarian cancer. Mutations in the BRCA1 or BRCA2 genes can be passed from mother to child or from father to child. If a person has a mutated BRCA1 or BRCA2 gene, they have a 50% chance of passing the mutated gene to each of their children. Just because your mother or other women in your family had breast cancer, however, does not mean that they had a mutation in a BRCA1 or BRCA2 gene, and does not mean that you have a mutation in either gene. Only 1 in 10 women with breast cancer have a mutation in BRCA1 or BRCA2 gene. Women lacking a mutation in a BRCA1 or BRCA2 gene have a 12% lifetime risk of developing breast cancer. Women with an abnormality in a BRCA1 or BRCA2 gene have a 3 to 7 times higher risk of breast cancer than do other women. However, even if you inherit an abnormality in a BRCA1 or BRCA2 gene, it does not mean you will get breast cancer or ovarian cancer. Women with a mutation in the BRCA1 gene have a 50% lifetime risk of developing breast cancer. Women with a mutation in the BRCA2 gene have a 50%-60% lifetime risk of developing breast cancer. It is important to remember that, in addition to genetics, there are many other risk factors (for example, diet and lifetime exposure to estrogen) for breast cancer and ovarian cancer. The presence of an abnormal gene represents only one of the risk factors for these cancers. 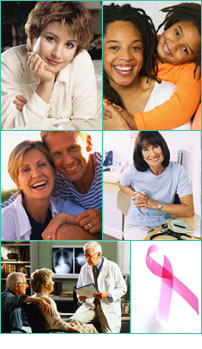 You can take charge of maintaining breast health. Be diligent about monitoring the health of your breasts and staying current with self breast exams, clinical breast exams, and mammograms. Consult your doctor for advice on other preventative measures that you can consider. The key is to not allow yourself to be consumed with worry. A healthy lifestyle and a positive attitude are great contributors to wellness. 1. American Cancer Society. Glossary.